Last week was a marathon week of cooking and I’m still catching up on posting the results of those endeavors. 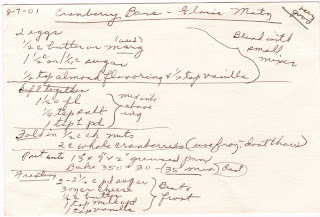 This recipe for Cranberry Bars is one that I made for my husband’s pot luck last Friday and seeing as how he came home with an empty tray and the regret of not saving some for us, I think they went over very well. When I think of “bars” I usually think of a rich, dense dessert like the caramel bars, however, these are more like a cake with a rich cream cheese frosting. I would describe them as the perfect balance of bitter and sweet – much like my chinchilla, Chico. I promised I’d write more about him and he recently provided the perfect opportunity. I got Chico about five years ago through Petfinder.com. I had recently moved to Minnesota and was in dire need of some animal companionship. Since I was living in an apartment, my options were pretty limited. Through a recommendation from my parents’ vet, I began to research chinchillas and just happened to find one up for adoption down the street from where I lived. Chico came from a home where he was abused by other chinchillas so it took a while to earn his trust. After six months of sitting with him and tempting him with raisins, he finally let us pet him for longer than a passing graze. It was totally worth the wait, he’s the softest thing I’ve ever felt. I wanted nothing more than to bury my face in his fur, but he wasn’t going to allow that kind of contact. Chico has his own room in our house and we let him out of his cage to play (there’s a baby gate on the door so that he’s confined to his room). Chinchillas can’t get wet, they require a dust bath to clean themselves and need to bathe often. If we don’t visit Chico at least every other day, he gets quite angry. Ryan and I have dubbed this behavior “chin-tude.” For such a little critter, Chico has quite the personality and a wide range of sounds that let us know what level his chin-tude is currently at. Click here for a link to a site that has clips of chinchilla sounds and what they mean. When Chico is in one of his “moods,” we can usually count on him taking out his frustration on us either through his chortles or by little nips on our hands. He never bites, it’s just more of a warning that he’s not happy about being forgotten and is demanding no less than our undivided attention. Needless to say, he wasn’t happy at the arrival of Murphy who not only took away some of that attention, but is also rather noisy during the day when Chico sleeps. Murphy, on the other hand, loves Chico and thinks it’s pretty cool that we let a scrabbit (squirrel + rabbit) live in the house. He can be a bitter little creature, but he can be unbelievably sweet as well. When I sit with him, he will curl up on my lap and stay as long as I pet him. One night I sat with him in my lap, reading a book and running my fingers through his silky hair for almost two hours. And last summer, I finally got my chance to rub his fur all over my face. He had to go to the vet for an eye check-up, a trip that I was not excited about because he HATES being picked up and placed into his cat carrier (that’s what we use to transport him). But I think the entire trip scared him so much that he was literally petrified. When we got to the vet, he didn’t move. I picked him up out of the carrier and he sat frozen in my arms. He even let the vet put him in a little cup to be weighed! I was shocked. I decided to seize the opportunity and rubbed him against my cheeks. The vet looked at me like I was nuts. I told her Chico’s history, how long it took us to even be able to pet him, and how during that entire time I wanted nothing more than to cuddle the softest creature on earth, but never could. She smiled, reported that he was healthy, and told me to take as long as I needed with my pet. Cranberries are a lot like a chinchilla with a bruised ego: they can be pretty bitter, but give them enough sugar and you’ll want to savor every moment you’re with them.